For a beautiful complexion there is nothing better than Ginvera’s Green Tea range. Ginvera’s collection of Gift Sets make the perfect presents for loved ones who like to take care of their skin. The Perfect Complexion set contains all you need to make your skin look and feel brighter, smoother and more radiant. All the products in the Ginvera range contain green tea extract which is well-known for being a powerful natural antioxidant. This means it can effectively cleanse the skin and remove bacteria which causes blemishes and it can protect the skin from harmful UV rays. Not only this, but it is also rich in Vitamin E which makes it perfect for hydrating and nourishing the skin to keep lines and wrinkles at bay. This clever potion works on dry, dead skin cells, buffing them away to reveal fresh and healthy skin beneath. This makes your complexion far brighter and more radiant and makes your skin feel beautifully smooth and soft. Marvel Gel also removes blackheads and helps to control sebum production in order to prevent shiny skin and blemishes. For a completely flawless complexion you can’t find a better BB cream than Ginvera’s. It provides light coverage in order to make your skin look perfectly and naturally smooth without clogging your pores or feeling sticky. As well as green tea it also contains Allantoin, Ginseng and Angelica extracts to encourage cell renewal and help to revitalise your skin. Plus it has SPF30 protection against harmful UV rays to keep your skin in beautiful condition. No scent is as refreshing or stimulating as lemongrass, so whilst pampering your skin you can light this gorgeous handmade candle and feel utterly revitalised. A reusable canvas bag with the sophisticated Ginvera logo. 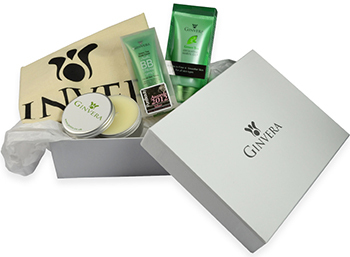 Everything in the Ginvera Perfect Complexion Gift Set is wrapped carefully in tissue paper and presented in a sleek white box tied with a silk green ribbon.